I sometimes go through the computer archives for images for the blog or eBay, or just because I like to look. I go back a couple of years just to refresh my memory on past projects - see I can use the computer, I'm not really a Luddite! 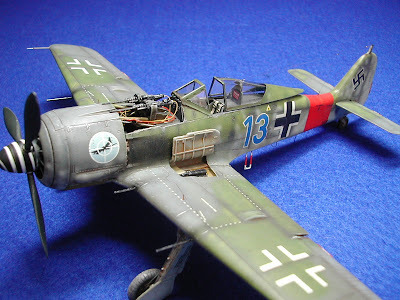 Just recently I discovered evidence that I had built the Eduard Focke Wulf 190. Quite a revelation. Maybe it's just my age affecting my memory....Anyway, here, after almost eighteen months, are the photos. A subject as popular as this has had many incarnations over the years. 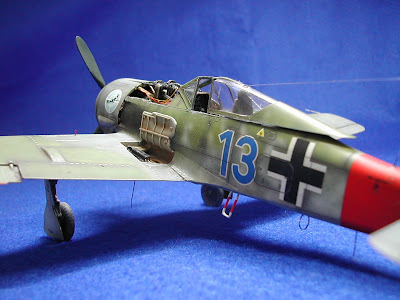 Remember when we thought that the Monogram and later the Fujimi FW190's were good? Much later, Tamiya introduced their rendition which eclipsed them all. Next came Hasegawa's A3/A4 series. As good as that one was, it was shoved rudely out of the way by the all-singing, all-dancing Eduard kit. So what's so special about the Eduard offering? Is it the engraved panel detail? Or the multiple choice decal sheet? You can get that with Tamiya or Hasegawa. No, it's the colour etched parts, the engine and the weapons detail. The fit of the parts is not always wonderful, especially around the nose area, and the instructions are not always as clear as you'd like. So what's the attraction? Maybe it's the challenge. As brilliant as Tamiya is, it's too clinical and quick. With Eduard, it's a real project. 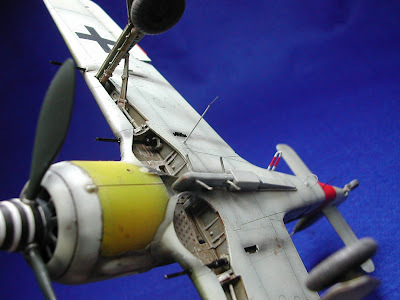 It feels as though you are building the real aircraft in miniature. 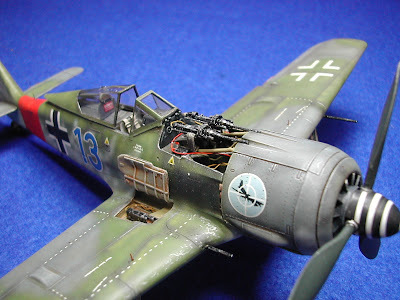 It's a tough, tricky little kit of your favourite airplane which you have to work on. So when you've completed it, a pat on the back is due. A big well-done is appropriate. Especially from yourself. I don't mean to be cheeky, but what is the story with this one? :) Is it available? Also, do you have any tips on how to get rid of decal outlines? I'm a tad dense as how this is to be done. .... oops, I pressed on the publish button too soon. The reason I ask is because I was think of an open cowling number showing the engine, either all together or partially. Regards. This was a commission I made a long time ago for a customer. 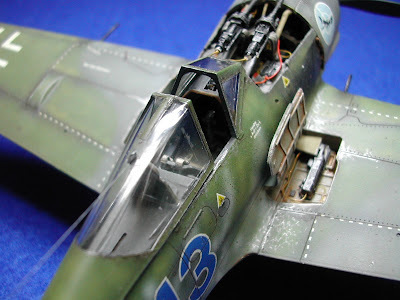 The dreaded silvering..If you cut off the carrier film painstakingly with a pair of sharp scissors you'll get rid of silvering, but you still have the obvious-looking 'step' on your model surface. I deal with it by making sure I have a gloss surface; then, with a soft no.5 or 6 brush I apply a layer of decal setting solution. I can then slide the decal off the paper straight onto the model and gently smooth it with a soft brush. If silvering persists, I take a pin or a scalpel point and stab the area gently. Another coat of setting solution and the decal conforms to the the model's surface. Sometimes you need to persevere for while. Hope this helps, thanks for your response Daniel.